Kevin Kramer is the new senior vice president of the Products Profit center at Production Solutions. He's worked hard for all his success. It's taken him years to perfect a non-clammy handshake. But Kevin Kramer harbors many dark secrets. In fact, for everyone in these stories, avoiding the truth is a full-time job: An HR manager tries desperately to maintain order, even as the entire software department vanishes under mysterious circumstances. An estranged sister devises her comeback by throwing together a DIY wedding shower. A man who wears a Chewbacca costume feels he is uniquely qualified to divide the world into winners and losers. And a call center representative tries to give himself a pep talk after a particularly egregious client interaction. The satirical short stories in "Kevin Kramer Starts on Monday" tell the tales of souls adrift in a corporate netherworld. The collection details the delusions the characters wear as comfortably as their khakis and no-iron button downs to skewer corporate culture and more generally, the lies we tell ourselves as humans in order to persevere. 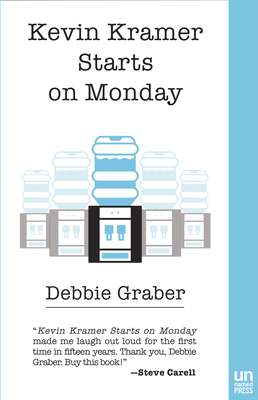 Debbie Graber has performed at Second City, worked in an office, and received an M.F.A. in Creative Writing from U.C. Riverside at Palm Desert. Her stories have appeared in "The Nervous Breakdown," "Harpers," "Zyzzyva," "Hobart," and elsewhere. "Kevin Kramer Starts on Monday" is her first collection of stories. She lives in Los Angeles with her husband.